I can't believe this is my 5th card in one week! I'm on a roll! And you know what? The confidence is starting to build more and more. But who am I kidding? I still need help when it comes to colour schemes. 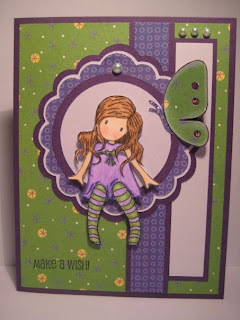 So for this card, I chose the colours on this week's Color Throwdown challenge and used them for Laura's Sketch 26 on the 2S4Y blog, which by the way is celebrating their first blogoversary with their 1st Annual 2 Sketches 4 You Ultimate Card Showdown on June 1 . They have an incredibly amazing grand prize posted on their blog for the occasion, too, so be sure to check out it out. 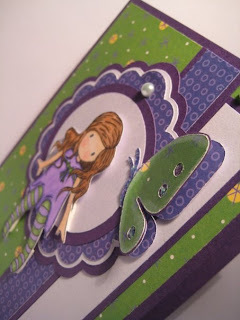 I used another one of my precious Sugar Nellie stamped images, the butterfly on the Cricut Happily Ever cart cut at 1 1/2", and the scalloped tags on the Celebrations cart at various sizes, two of which were cut using the shadow feature. 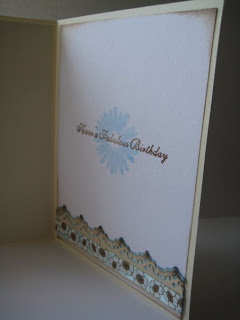 The patterned paper was from the Cricut Celebrations pad and were two sheets I thought I would never use. And of course, I added some stickles to the butterfly. I am uber-pleased with this card. Well... except for the pearl I added to cover up the hole on the tag. In hindsight, I should have rotated the tag a bit so the hole would be hidden by the butterfly. Oh, well! Let me know what you think of it. 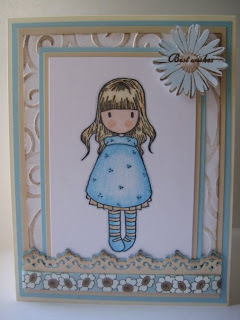 For one of my last cards, I used a stamped Sugar Nellie Gorjuss image and was happy with how the colouring turned out. So I've been meaning to colour in another one. I'm always unsure of colour schemes so I turned to the Colour Create challenge and was happy that I actually have paper in those colours (sky blue, tan and ecru). And since I always need inspiration in terms of layout, I opted to use the sketch over at Taylored Expressions Cupcake Challenge. I used the d'vine swirls embossing folder for the matte and rubbed it lightly with a chocolate brown pigment by Craft Smart. I coloured the image with my Prisma coloured pencils, stamped the daisy with a light blue ink by Studio G and used the second step stamp in the chocolate ink. The border punch is Fiskars and I found the ribbon at one of the clearance bins at Michael's. I also did the inside of the card as well. This is my first card using a Color Throwdown challenge and I chose to combine it with the Stamps and Smiles sketch for this week. AND... I nervously coloured in my first Sugar Nellie Gorjuss stamped image that was sent to me by a very talented lady named Karen. She sent me a bunch of images but I didn't want to take the chance of ruining any of them so I was relieved that my first colouring attempt turned out okay. 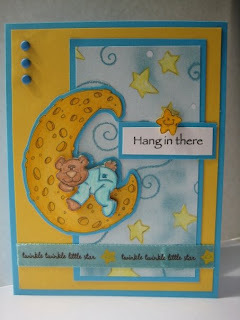 I also referred to the card she sent along as well for inspiration. You should really have a look at her blog to see all the wonderful work she does. The turquoise paper is DCWV. The stamped sentiment is from Dollarama. 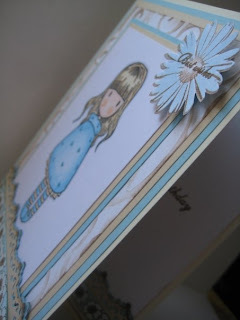 I used a Fiskars daisy punch for the border and added some Prima flowers as embellishment. And for the colouring, I used my Prisma Colour pencil crayons. I will probably use this card to give to my sister-in-law for her birthday which is in a few weeks. I think she'll like it since she seems to like anything "girly." I'm back! I had a terrible itch to use my Cricut to make a card today and I decided to use my latest addition - Disney Happy Ever After. I used the butterfly cut at 2 3/4" and added some stickles. I have a feeling it won't be the last time I'll use this butterfly. It's so simple and so cute! 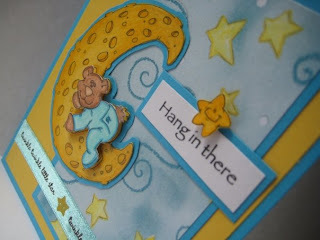 So here is my entry into the Inspirational Card Sketches challenge for this week. I hope you like it. I nabbed a really good deal on the Disney Happily Ever After cartridge a few weeks ago. I paid about $29 Canadian which is amazing and I couldn't wait to open up the package when it arrived at my door this morning. I flipped through the booklet and found cute little images such as the owl and squirrel, oh and we can't forget the butterfly. I'm just hoping I can find a decent block of time to do some cardmaking today and maybe get a head start on my goddaughter's birthday invitations. But can you believe I'm still cleaning up after the party we had for my son's first birthday last weekend? I took a break from it yesterday and decided to clean out my car while my son napped and my daughter was in school. I'm so glad I did because I found my camera wedged underneath one of the car seats. Yahoo! What a relief!